After Iraqi officials said an airstrike wounded Islamic State group leader Abu Bakr al-Baghdadi, here are some questions and answers about what's known now about his status and the effect it could have on the extremist group that holds a third of both Iraq and Syria. A: Al-Baghdadi, believed to be in his 40s, was born Ibrahim Awwad Ibrahim Ali al-Badri al-Samarrai in Samarra, Iraq. He led al-Qaeda's branch in Iraq during the US-led war there, but his chapter was disavowed for its extremely bloody attacks. It later became the Islamic State group after seizing territory in Syria and Iraq and declaring a self-styled "caliphate." Q: What happened to al-Baghdadi? A: An Interior Ministry intelligence official told The Associated Press that an Iraqi airstrike Saturday wounded al-Baghdadi during a meeting in the town of Qaim, near the Syrian border in Iraq's western Anbar province. The official cited informants within the militant group. A senior Iraqi military official also told the AP he learned in operational meetings that al-Baghdadi had been wounded. Q: What does Iraq say now? A: Iraq's Defense and Interior ministries both said Sunday that al-Baghdadi had been wounded. On Monday, Iraqi military spokesman Saad Maan Ibrahim walked back from the earlier Defense Ministry claim, telling the AP: "The investigation is ongoing into the possible injury of Abu Bakr al-Baghdadi." He added that several prominent Islamic State group leaders were killed in the attack, but did not name them. A: No one knows for sure. Rami Abdurrahman, director of the Britain-based Syrian Observatory for Human Rights, said some Islamic State militants wounded in the airstrike near Qaim were taken across the frontier to the Syrian border town of Boukamal. He didn't know if al-Baghdadi was among them. 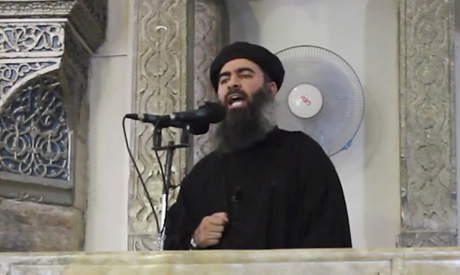 Q: How will al-Baghdadi being reportedly wounded affect the Islamic State group? A: Analysts believe Islamic State militants likely will continue their offensive, though its morale could be shaken as the strike reportedly killed other top leaders in the group. Q: How is the battle against the Islamic State going now? A: On Monday, US Central Command said the US-led coalition conducted 18 airstrikes in Iraq from Saturday to Monday, including two in Qaim that destroyed an Islamic State group armored vehicle and two militant checkpoints. Britain's Defense Ministry also said Monday it used one of its Reaper drone for the first time in the campaign against the extremists in Iraq.